I join Maureen, a close friend, for a weekend trip to the Washington DC area—my first-ever trip to the DC area. I had heard, previously, about the impressive urban design in the area over the years, but am nevertheless surprised by the breathtaking quality of the urbanism and, of course, the astoundingly proud civic buildings of our nation's capitol. My introduction to the DC area was to fly in to the Dulles Airport. I was told that the National Airport is much better, in part because it is closer in and served by the Metro transit, whereas Dulles is in a remote suburban location not served well by transit. Dulles is an odd place, as exemplified by their very peculiar "trams" which shuttle passengers from the terminals to the main airport. There are strange white chimney-like structures above these rubber-tire vehicles that make them appear to be terrestrial sailboats or some twisted, dated effort by a George Jetson-wannabe. Soon after leaving Dulles for the Embassy Suites Hotel in Chevy Chase, I notice perhaps the most important urban design flaw in the DC area: BIG roads and highways, which undoubtedly fuel a great deal of urban sprawl in the area. A meaningful amenity by Embassy Suites in Chevy Chase is that the clean, fast, convenient, comprehensible, and comfortable Metro subway train system has a terminal in the basement of the Hotel, enabling easy access to points throughout the metro area. On my first morning, I venture out alone on the Metro to see the famous Pennsylvania Avenue and The Mall federal building complex. Perhaps my first eye-opener is seeing the escalator tubes that feed the Metro terminals to and from street level. The tubes are ENORMOUS, yawning concrete tunnels-relatively long as far as escalators go. The first thing I notice during my walk is that the people in DC seem noticeably more rushed and in a hurry than I am used to in my small city of Gainesville FL. I suspect this is merely an aspect of "big city" life. Coming out of the famous Union Station terminal for Metro, heading toward the Capitol Building (photo upper left), I pass the Senate Office building, the Supreme Court building (which is fronted by the obligatory protestors carrying picket signs-in this case, religious protestors), and the Library of Congress. In this area is the Capitol Building to the southwest of the Station. I am soon confronted with a significant disappointment for my trip. The Mall and Capitol Building are in the middle of being prepared for the upcoming 2001 Presidential Inauguration of George W. Bush. To prepare for the expected hundreds of thousands of spectators for the event, thousands of chairs have been set out on the lawn, large canvass tents have been erected, most walkways and pools of water are ringed with unsightly fencing, hundreds of Porta-Potties are laid out, and sheets of plywood are laid up against the steps of such buildings as the Lincoln Memorial. Of course, this is to be expected, given how frequently The Mall and the Capitol Building host major national events, demonstrations, and protests. Nevertheless, it mars my intent to shoot several photos of the area. Another significant but unsurprising dissatisfaction is the discovery that there is a vast asphalt parking lot on the east side of the Capitol Building. Unsurprising and emblematic, given the American love affair with our cars in, as Jane Holtz Kay puts it, this "asphalt nation." There is nothing more symbolic of what we have become as a nation than to have a huge sea of parking next to our capitol building. Pennsylvania Avenue is, like The Mall, similarly lined with fencing and bleachers for the upcoming Inauguration parade down that street, which heads northwesterly from the Capitol Building to the White House. I am pleased to see the many pedestrian-scaled "post-mounted" traffic signals along the Avenue (and throughout the metro area). I am displeased to see the size of the 5- to 7-lane Avenue, and many of the "modernist" contemporary building styles that appear so out of fashion—such as the J. Edgar Hoover Federal Bureau of Investigation Headquarters building. Arriving at the White House requires me to detour hundreds of yards to the south of the sidewalk that passes in front of the White House, which apparently is frequently necessary for security purposes (President Clinton is preparing to helicopter out from the White House front lawn, and the long delay in his departure means there were a large number of unhappy, frustrated tourists in the vicinity. Bypassing the White House, I walk into the western end of The Mall to see the somber, stark Vietnam Memorial Wall, sadly containing the names of those who died in that war. I understand that there is important symbolism in how the wall is designed. The Memorial has a walk along the wall that starts above grade (symbolizing being alive), decends below grade (symbolizing death) and then rises again (a return to life) as you exit. Next to the Memorial is the Lincoln Memorial building. To the east across the Reflecting Pool is the towering Washington Monument. Along The Mall I also pass the National Art Gallery and the several other buildings which make up the Smithsonian Institute complex, and nearby, a few months later while in town for Maureen's Marine Marathon run, I visit the Iwo Jima memorial. That afternoon, I tour Georgetown (photo at upper right) with my friend Maureen. Georgetown, to a city planner like myself, is extremely impressive. Fantastic rowhouse urbanism with residential neighborhoods and small retail shops and offices interspersed within easy walking distance. We briefly looked at Georgetown University, which contains some wonderful gothic architecture, but which, oddly, contains a very unsightly modernist library at the entrance region of the campus. Like my visit to Charleston, there is an important sign of my enjoying the fantastic urban sights of the Capitol: That evening, my feet and legs are extremely sore from all the walking I have done (and I'm no couch potato, given how much I work out at a fitness center and commute by bicycle each day). The next day—completely disregarding my sore muscles—I take Metro to the Adams Morgan neighborhood (where the planning director in my office lived for 8 years), Dupont Circle, and Cleveland Park neighborhoods. 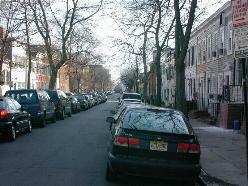 Each neighborhood is again filled with high-quality rowhouses, which makes for a wonderful walking experience. Cleveland Park is the most "suburban" of these three neighborhoods, and is similar to the Duckpond neighborhood I live in here in Gainesville. At the western edge of this neighborhood is the highly impressive and imposing Washington National Cathedral. 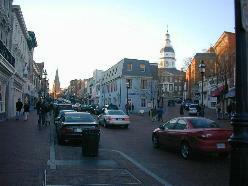 That afternoon, we drive east into Maryland to see downtown Annapolis. This community is a very pleasant treat for me. The town is dripping with nautical ambiance. I am very impressed by the design of the town. 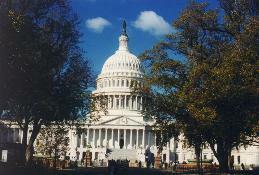 Important civic buildings, such as the Maryland Capitol Building and a large church, are placed on a circular axis (as are the White House and the Capitol Building in DC). From the axis of these buildings are radiating streets. The clever design is that diagonal alignment of these radiating streets reduces walking distances, and allows a single, important civic building to create a terminating vista on several streets that feed the building (Terminating vistas with an important civic building is a vital urban design principle. It makes for a very picturesque, walkable environment, and creates a great deal of civic pride in the major institutions of the community. Photo at left.) Main Street terminates at both the Capitol Building and the City Dock at the Annapolis harbor. Both the U.S. Navel Academy and St. Johns College are located in Annapolis. Of the places I visit in the DC region, Annapolis is head and shoulders above the rest as a place to experience. 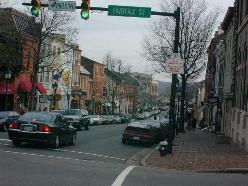 Very vibrant and walkable, with lots of brick streets and sidewalks, and historic buildings. Unfortunately, Annapolis is not on a Metro subway line. On Sunday, Maureen and I take the Metro to Old Town Alexandria (photo at right). Again, a town filled with the impressive urbanism of colorful rowhouses lining up against the sidewalks of streets (a few of which are historic cobblestone). There are several very old, historic buildings in Alexandria-such as the home of Robert E. Lee and a residence of George Washington. The town features unusually wide sidewalks and, unfortunately, wide streets.